Speaking on his radio show, Hideo Kojima stated that the Metal Gear Solid: Legacy Collection which contains Metal Gear Solid, Metal Gear Solid 2, Metal Gear Solid: Peace Walker, Metal Gear Solid: VR Missions, and Metal Gear Solid 4: Trophy Edition will not be coming to the current gen version of the Xbox, because it cannot hold the amount of space required to contain the beast that is Metal Gear Solid 4: Guns of the Patriots. 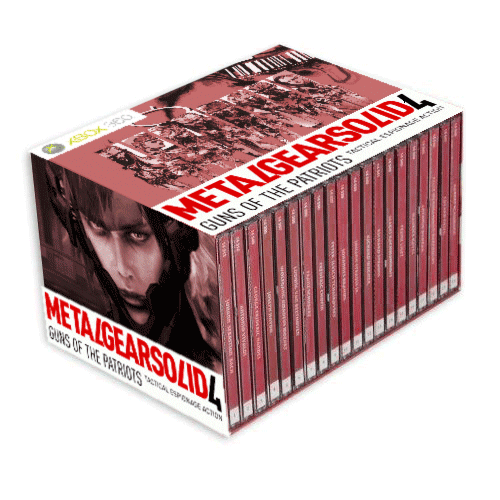 One of the co-hosts pointed out during Kojima's show that MGS4 would need a seven (yes I said seven) DVD's in order to play MGS4 on the Xbox 360 compared to the 50 GB storage of just one blu-ray disc. Kojima did remain optimistic and state that the MGS: Legacy Collection could release on the next gen Xbox, this assuming of course that Microsoft adapts to blu-ray and if they do not, then I'd say they are going to be in worse shape then Nintendo at this point and basically just gave Sony the keys to the kingdom. lol this picture always makes me laugh Siren.